A quick, easy and pretty scrummy dessert can be so easily made with store cupboard basics and it can look good enough for a posh tea party or supper time pud. 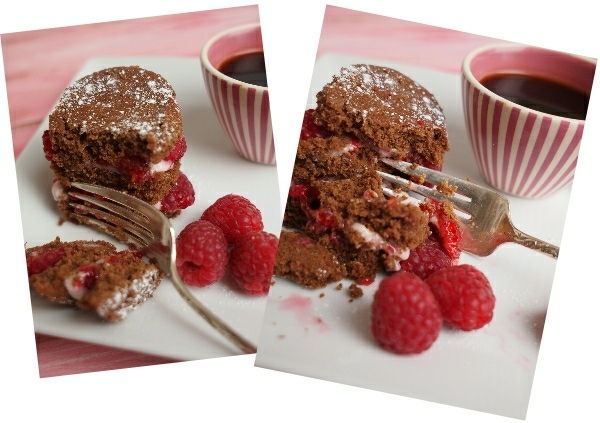 Chocolate and raspberries go together a bit like pees and carrots as Forrest Gump would say. If you haven’t got raspberries then strawberries would be just as good for this. 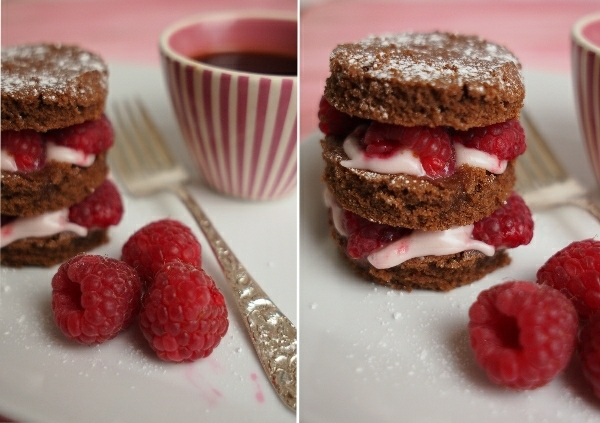 Enjoy these chocolate and raspberry cakes! Beat together the butter and sugar until fluffy. Sift together the flour, cocoa powder, salt and add half to the sugar and butter mixture. Whisk the eggs along with the milk and add half to the above mix. Then follow with the rest of the dry ingredients and finally the rest of the liquids. Spoon the cake batter into the oven tray and spread out to about ½cm (1/4") thick. Pop into the oven for approximately 10 minutes or until it springs back when prodded lightly in the centre. Leave to cool before cutting out rounds with a simple cookie cutter (or upturned glass). Starting with just a tablespoon of cream cheese, add a few drops of vanilla extract and start stirring in the icing sugar. You want to build up till you have a paste that holds its shape a bit when you spread it thickly on the base cake. 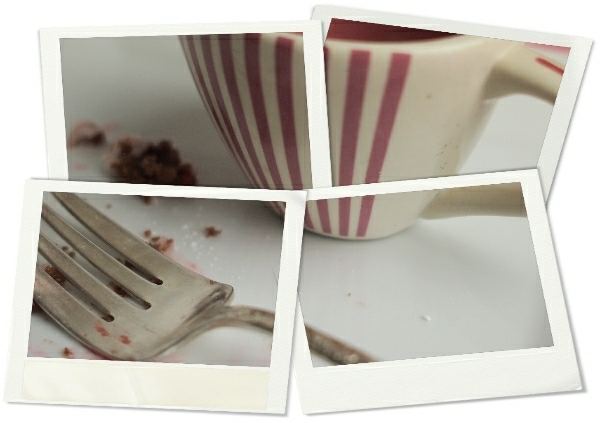 Cut two raspberries in half lengthways and place the 4 halves on top of the sweetened frosting. Now use an extra little dollop to act as glue for the next layer to sit on. Cover this with the frosting and more berries and the final cake lid. Sprinkle with icing sugar to finish off.